Kit Grady is a full time children’s illustrator and author living in the mountains of Asheville, North Carolina. Her love for drawing animals, nature and children began very early. She continued her passion studying art at Virginia Commonwealth University and later studied under Caldecott winners Uri Shulevitz and Gale Haley. Kit has produced greeting cards and created a weekly children’s page for the local newspaper. Her first book, by Windswept House Publishers, was followed by projects with The United Methodist Publishing House/Cokesbury, an educational publisher, Kaeden Books, Kicks Club Books, and the Collier Creative Group. She has also illustrated several books for Guardian Angel Publishing. She is a member of the Society of Children’s Book Writers and Illustrators. 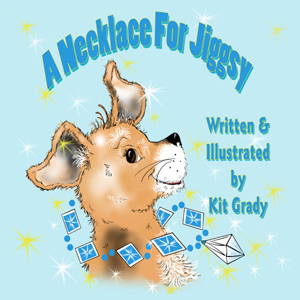 Kit, best known for her bright colors and expressive animals, recently published a book called A Necklace For Jiggsy. The book is about a dog named Jiggsy who finds a beautiful diamond necklace. This discovery will change his life in several different ways, but most of all is that he learns the importance of honesty and doing the right thing. I highly recommend buying this book for the child(ren) in your life! Overall: We give A Necklace For Jiggsy a 9/10! How would you like to win a copy of A Necklace For Jiggsy? First, visit Kit Grady's website, then comment here and tell me about another book of hers you'd love to own. This giveaway will close on December 23, 2010 at midnight. We were sent A Necklace For Jiggsy free of charge for the sole purpose of this review; no other compensation was received. All opinions expressed are my own. I would love to have The Sister Exchange, my girls would love it. We have 3 cats so any of the Louie the cat books would be great. The Sister Exchange for me. entered baby name pool "jackie"
Hamster Holidays looks like a great book to own. arobimom at gmail dot com. Animal Sound Mix-Up looks like fun.